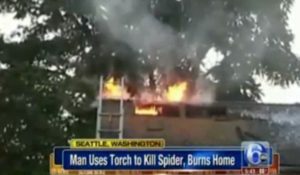 A man recently set his apartment on fire after he attempted to kill a giant spider with a torch lighter. A caregiver, for one of the men living in the building, told reporters that the fire started in an upstairs bedroom after a resident spotted a startling large spider. Apparently, the resident must have freaked out when he saw the spider, and he decided to burn it with his torch lighter. The spider was still ablaze when it scurried onto a nearby mattress. The mattress then caught on fire, and the flames quickly spread to a flag collection and the window curtains. The residents were unable to put out the fire with a garden hose, so they made a 911 call. Firefighters arrived on the scene and were able to keep the fire from spreading into the attic and neighboring apartments. Officials say that the apartment in no longer habitable, so the residents will all be forced to move out. Ladies and gentlemen, we’ve heard too many stories of people using fire to kill bugs and catching their homes on fire. If you have a problem with pests, please put your torches away. Call us at (949) 631-7348, and I assure you that we’ll find a safer way to help.